Poetry Press Week did not last for a week. Nor did it showcase presses. It did, however, have shrimp and a dj. Inspired by New York Fashion Week, Liz Mehl and Justin Rigamonte asked five poets to “use ‘model’ readers to present their newest work to a hand-selected audience of press, publicists, editors, and literary journals.” The poets each designed their own show and secured their own readers, but kept the results secret until sending their representatives down the runway. As the dj faded out, Mathew Dickman opened. He included seven poems and alternated between simple readings by men and women dressed in black, and performances that enacted each poem’s meaning. “Take ten paces,” says a reader, and two performers take ten paces. The enactments were the most memorable and served two poems well—“Daily Monster Dance” and “My Childhood is Your Childhood.” “The Sea, The Ocean, and The Coast,” suffered from an awkward interpretive dance performed nearly in the lap of an older audience member. This pattern held for the rest of the event; the unusual frame allowed an interesting encounter with most poems, but detracted from a few. Ashley Toliver’s two readers dressed in matching black leggings, short white t-shirts, and round buns. They alternated through a series titled “Ideal Machine,” at times using a strange, sing-song, legato diction, at other times a more straightforward cadence. Toliver’s mix of scientific terms and lyrical style held up well. I particularly enjoyed how vowels were highlighted by the diction. Britta Ameel’s presentation was by far my favorite. She asked local folk-phenom Laura Gibson to adapt her nine poems to simple acoustic songs. Gibson did an excellent job fitting music to the words, keeping natural rhythms intact, tiptoeing her slurs across consonants, and allowing each song to feel finished without resorting to repeating a line in the middle as if it were a chorus. Plus the audience got to hum the background harmonies. Carl Adamshick used four readers in a relay—each read a small portion of his poem “Black Snow,” then stepped to the back of the line to wait their turn. The poem itself uses a single voice, and though I could not discern a particular method for its division between the readers, it was an effective way of getting at the universality of grief. Zachary Schomberg presented an excerpt from Agnes the Elephant. The protagonist in the poem is a child, and Schomberg began by scrolling lines across a screen while a child read from backstage. “The missing boy had been missing his entire life…” It was chilling, and the words’ haunting images were given context by the boy’s voice. 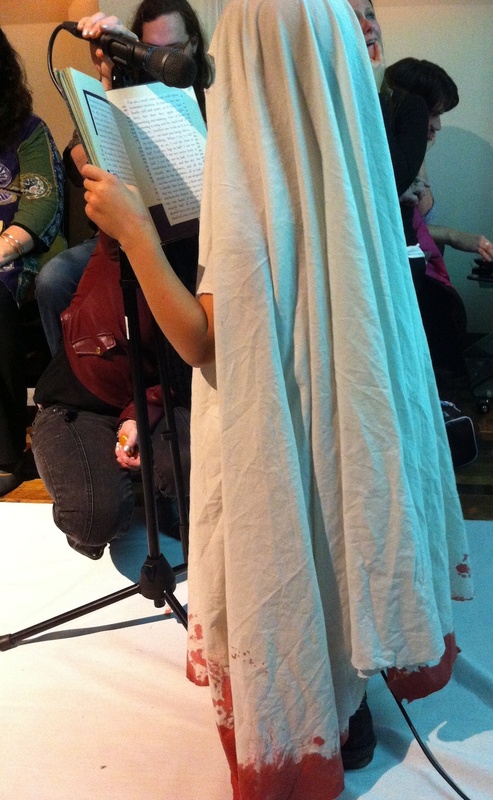 After reading from backstage for about thirty seconds, the boy came out dressed in a ghost costume—a white sheet with holes for eyes, the bottom edges of which had been dyed red. Unfortunately, they hadn’t cut the eye-holes big enough for him to see, and the mic wasn’t low enough for him to reach. After the boy fumbled a bit, two kind audience members jumped up to hold the book and the microphone so he could read with minimal interruption, but it felt as if we were more engaged with the boy’s performance—willing him to finish the piece—than with the poem. 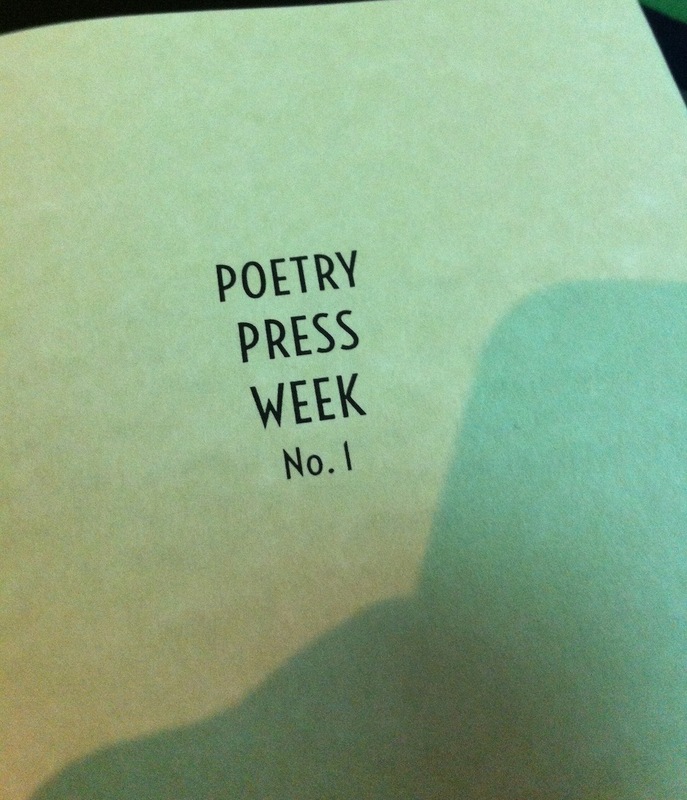 Poetry Press Week will happen again in the spring of 2014, and I, for one, will be there. Hiccups aside, I cannot wait to see what fascinating ways the new group of poets will choose to present their work. Not knowing what to expect is half the fun, and really, isn’t it also the mark of a good poem?